Pandora [pan-DOR-uh] is the fourth of Saturn's known satellites. It was discovered from photographs taken by Voyager during its encounter with Saturn by S. Collins and others. Pandora is the outer shepherd satellite for Saturn's F-ring. 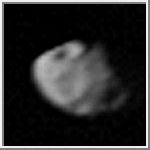 It has a diameter of about 114 by 84 by 62 kilometers (71 by 52 by 38 miles) and appears to be very heavily cratered. The two largest craters are about 30 kilometers (19 miles) in diameter. No linear valleys or ridges are visible. Very limited data is available to analyze Pandora. This is a shaded relief map of Pandora, the outer F Ring shepherd satellite of Saturn. As with all maps, it is the cartographer's interpretation and not all features are necessarily certain given the limited data available. This interpretation stretches the data as far as is feasible. The leading side faces forwards in the orbit of Pandora. The trailing side faces backwards along the orbit. Longitude 0 is at the righthand end of the leading side, and faces Saturn. As with all conformal (true shape) projections, the scale in these maps varies, increasing from the center to the outer edge. (Courtesy Phil Stooke). Stooke, P. J., "Shapes and Surface Features of Prometheus and Pandora," Earth, Moon and Planets, 62 (1993), 199-221.